Today's post is sponsored by Modsy, who helped us realize the potential for a challenging space in our home and is sharing the love with all of our readers by offering 20% off any regular design package with the code 17APART20! Last week we officially completed the last few details on the punch list for the kitchen reno and I have to tell you it feels amazing to have our entire downstairs in a more finished state than ever before. You might remember just as we kicked off the kitchen, we simultaneously began restoring our front parlor after moving our office upstairs (yes, it was a lot to bite off at one time!). Confident in the design for the two downstairs spaces, we barreled ahead, leaving the new upstairs "office" in what I can only describe as a sort of holding ground and storage space over the last several months. As you can see, we've been able to get work done with the makeshift setup we have up there, but the space is far from feeling like a welcoming, grown-up space. Honestly, I've felt challenged by this room. When we first moved in, we knew it would be a bedroom for Brandon and used the same layout that was already defined. It had two semi-builtin bookcases on either side of where a bed would go. Now that Brandon's moved on, we've been eager to take advantage of the additional space — and while we have no lack of ideas, I had a hard time envisioning a layout that could accommodate the variety of uses we have in mind. We're planning to tackle the office makeover later this year, and we'll need it to serve multi-functions with different zones, but want to achieve an overall look and feel that's cohesive, inviting and fresh, not forced or jumbled. Ideally we'd create zones for a desk with seating and storage, a sleep sofa or loveseat that can accommodate overflow guests when we need and a studio/storage zone for the jewelry I make. We're even considering the idea of moving the laundry to where the back staircase opens up into this room. As you can see, it's been a lot to wrap our heads around. I usually have a strong opinion about what I like, but I don't consider myself a designer so when the opportunity to work with Modsy arose, I jumped at the chance to work with an expert that would understand our aesthetic and give me well thought-out ideas for smart layouts. 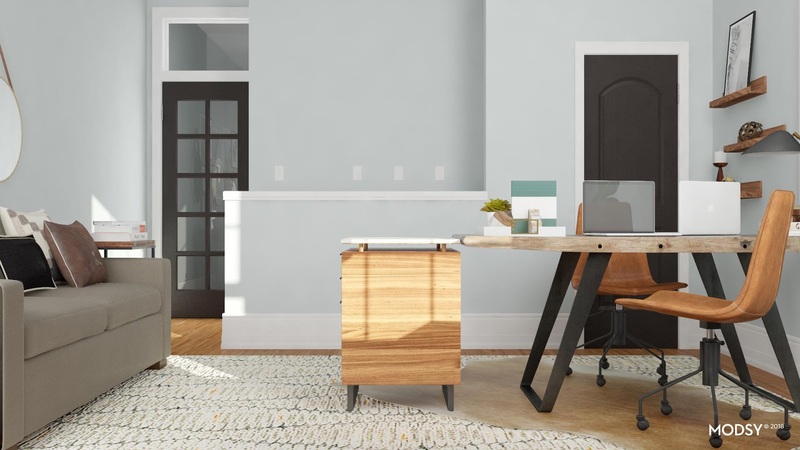 If you're not already familiar, Modsy is a personalized home design solution that helps you virtually re-design your space and "try on" all sorts of furniture before you buy. 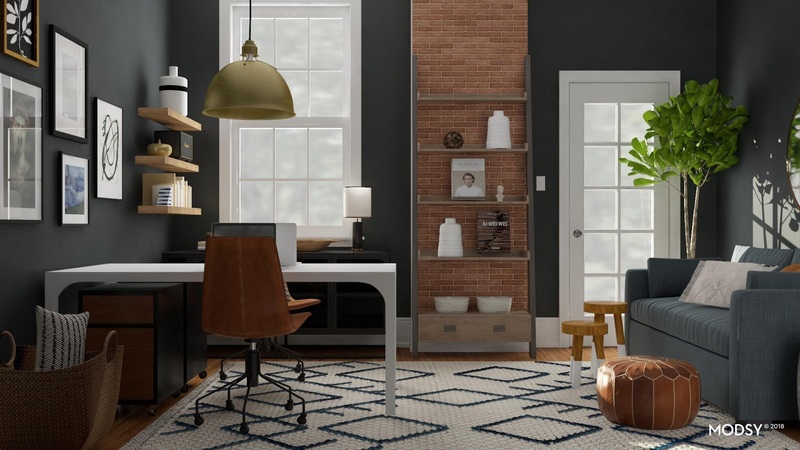 You can design, redesign and shop for your home all in one place. 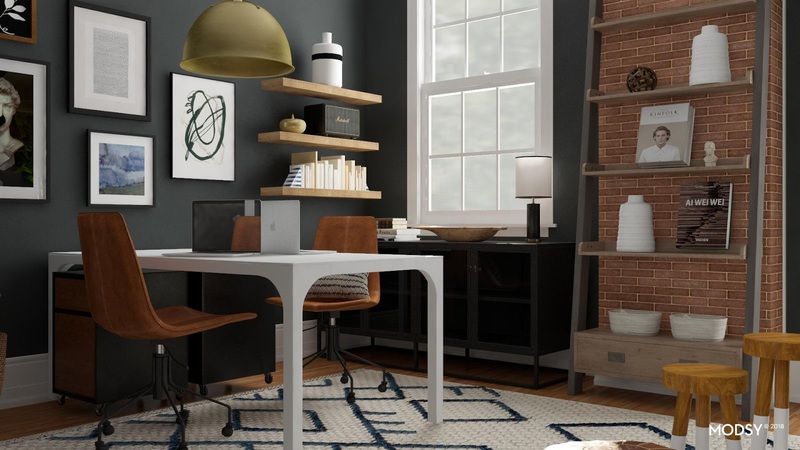 They have a team of professional designers that will spin up your exact room in a 3D rendering, then provide layout ideas with furniture and decor all based on your personal style and needs for the space. 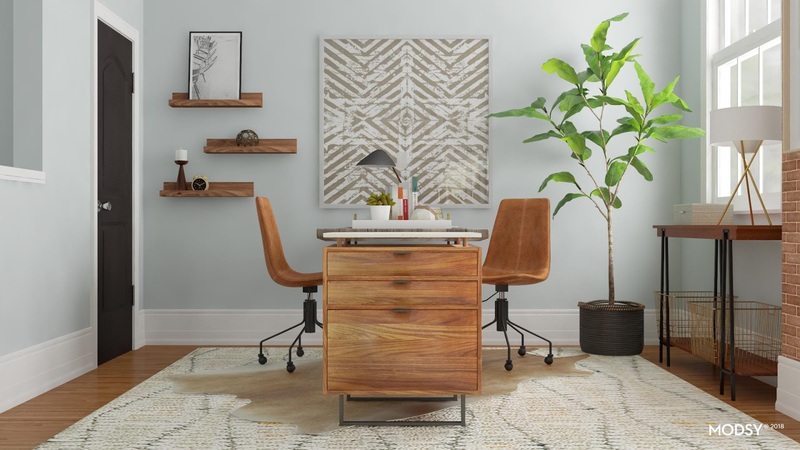 I've returned furniture that looked amazing online but didn't work in our home for one reason or another — it's not a fun experience, so I love the Modsy concept for taking the guesswork out of visualizing furniture alone. Reimagining our office with with Modsy was simple, interactive and felt like a fun game. I answered a few quick questions like which room I was designing, whether I was starting completely from scratch (they'll design around pieces you already have), and what my overall budget for the room was. 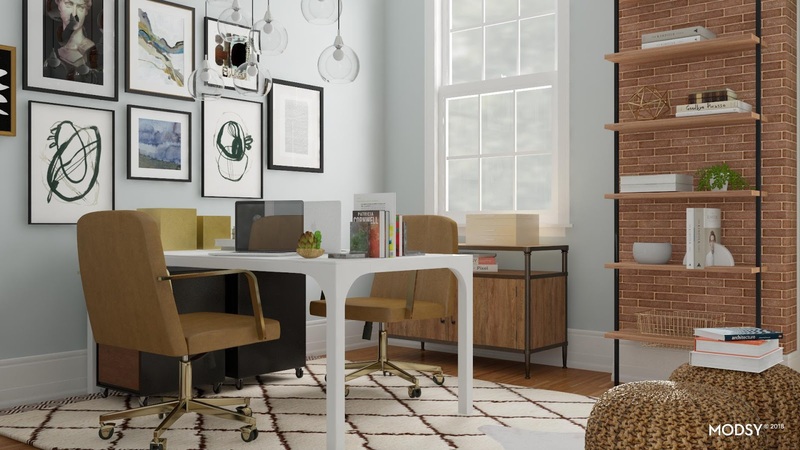 There's a style quiz that's eerily accurate and cute personalized touches like naming my project with my name and room "Mary's Office" that made the experience feel tailored. 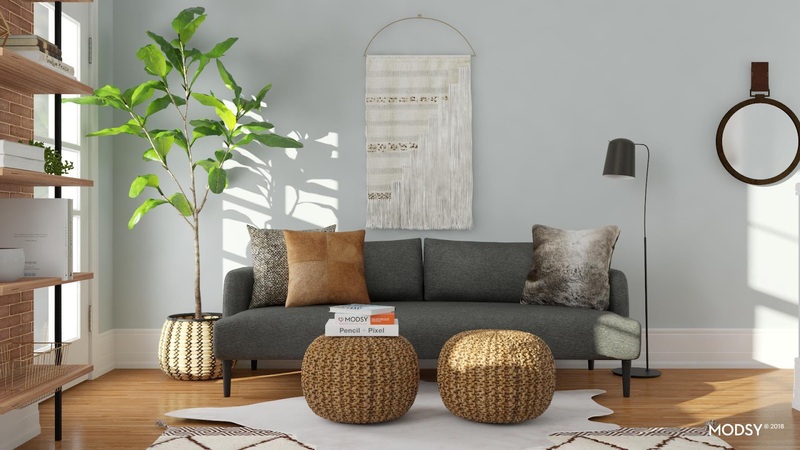 My style results came back as "Atomic Industrial:" Your furniture of choice is Danish modern, and you thrive in weathered spaces that show some history. Vintage metals and reclaimed wood paired with Atomic era furniture is your perfect blend. 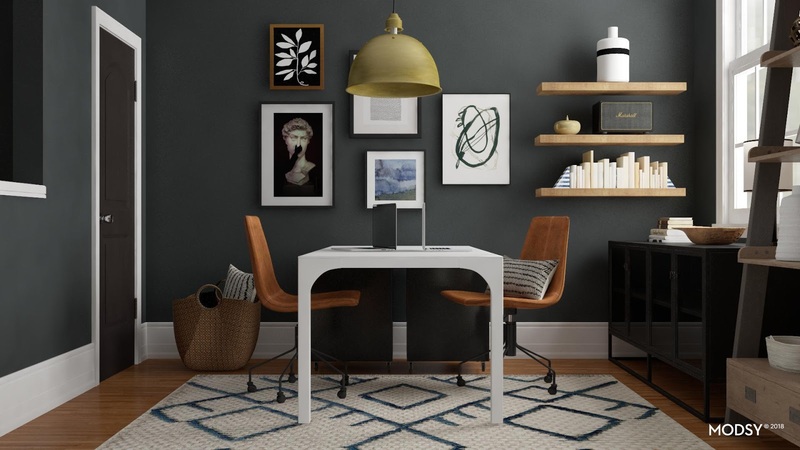 Atomic Industrial combines Industrial and Mid-Century Modern with a touch of Minimalist. This was hands down the most dead-on style quiz I've taken online. From there, I confirmed they nailed the vibe I was going for, sent the dimensions of the room and left the rest to Modsy. Opening up the designs about a week later felt like Christmas, and we can't wait to share the potential they came up with for our office. It's insane how well Modsy rendered this room of ours down to every last detail in 3D. They even included our fiddle leaf fig (thanks for the reminder to water it)! 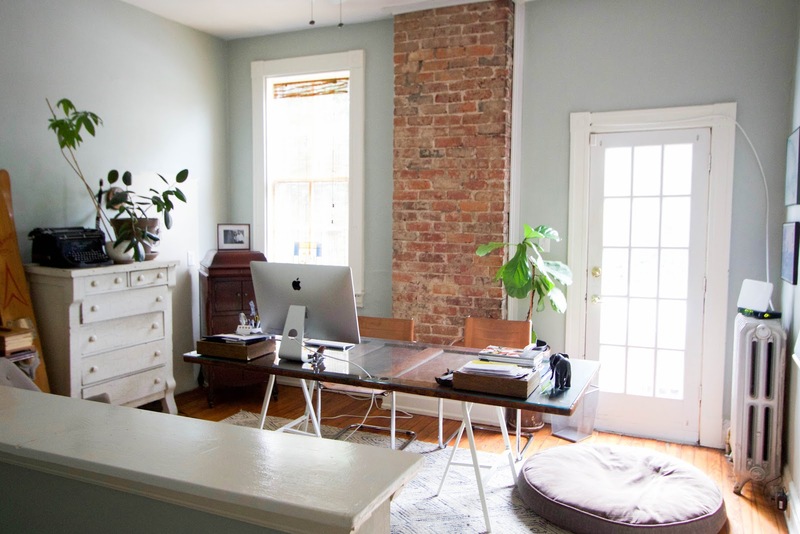 I love how both the office and sofa zones feel connected in this layout, and can imagine if we had overnight guests how they'd still feel like they had a welcome space of their own. Art can also be challenging for me, and the gallery wall along the sofa wall was something I would have never thought of on my own. Positioning the gallery wall above the desk feels like such a dramatic "moment" upon entering the room. 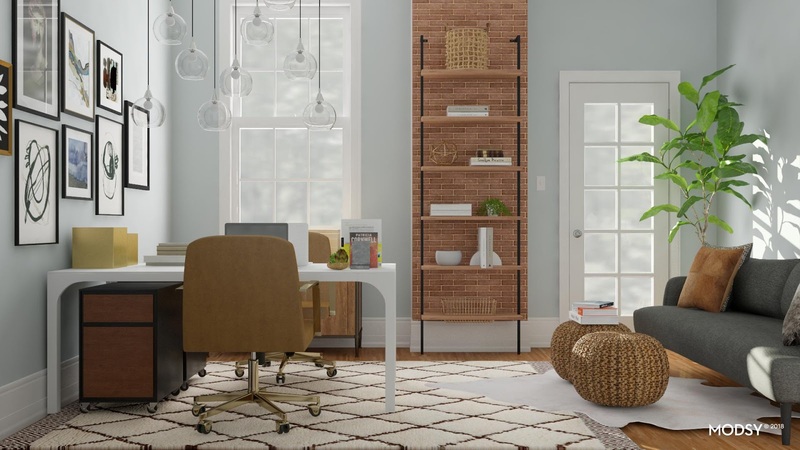 That and I never would have considered a storage solution along the brick chimney in this space, which we absolutely love and can't get out of our heads now. 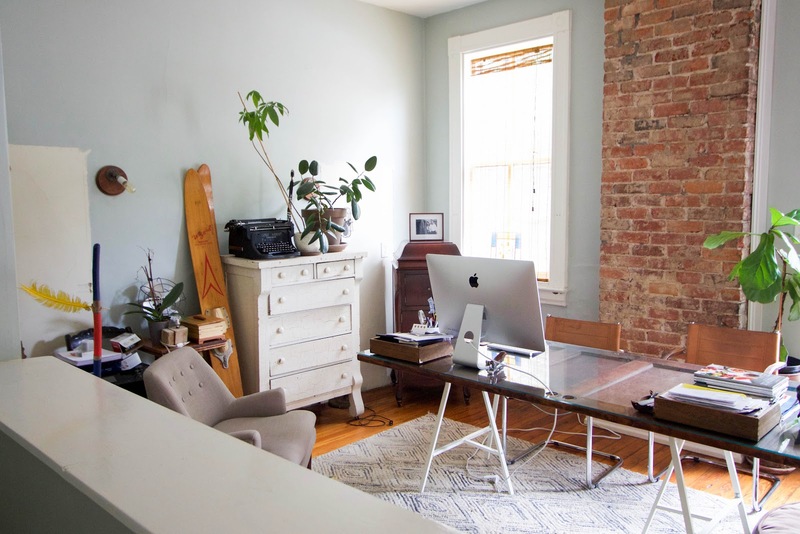 Julia Marcum is one of my favorite interior designers, so when I learned that she's now offering custom design services exclusively via Modsy, I just had to see her perspective on our office. It's the next best thing to Julia and Chris making my dreams come true by flying to Richmond for a personalized makeover. #cljsquad for the win! 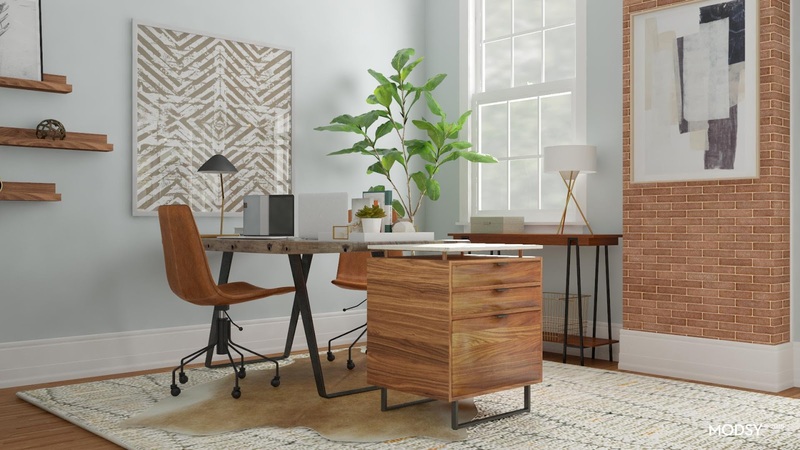 Even though Julia has only curated collections for living and bedrooms, Modsy worked a little magic around some of our existing furniture like the desk in order to give us the CLJ touch we were hoping to see. They even added a bold wall color to help each piece really pop. The storage piece under the window is a sideboard from Crate & Barrel I'd actually considered for our dining room. I love the idea of this piece as a makeshift jewelry studio — such a brilliant idea. Isn't it amazing how Modsy nailed our style, made the room feel connected with the rest of our house vibe and tied all 3 zones we requested into one smart layout? Working with them was such a confidence boost — it confirmed that the original layout I'd loosely imagined with the desk and sofa placement were on par with what a professional would recommend. 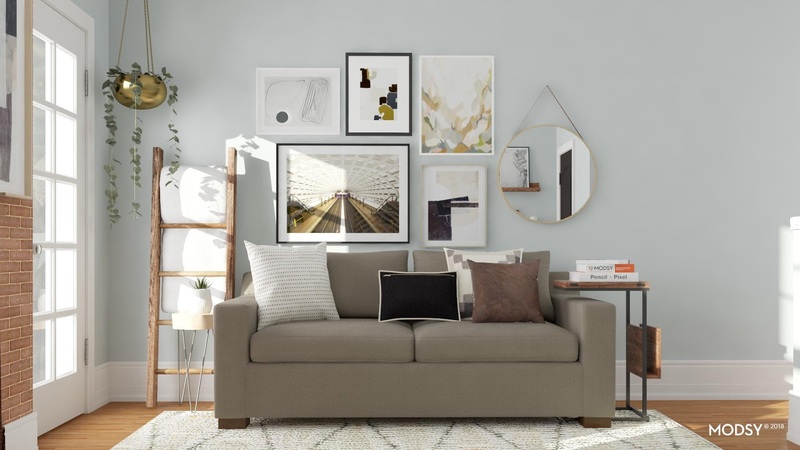 It also helped me consider new ideas like a gallery wall, and storage along the chimney and under the window that still feel tied together in a way that reflects our overall style. We love elements of all three designs, but are definitely partial to one. That said, we're eager to know which is your favorite? Let us know in the comments section below or on today's Instagram post before we land on a final decision. Want to try Modsy? 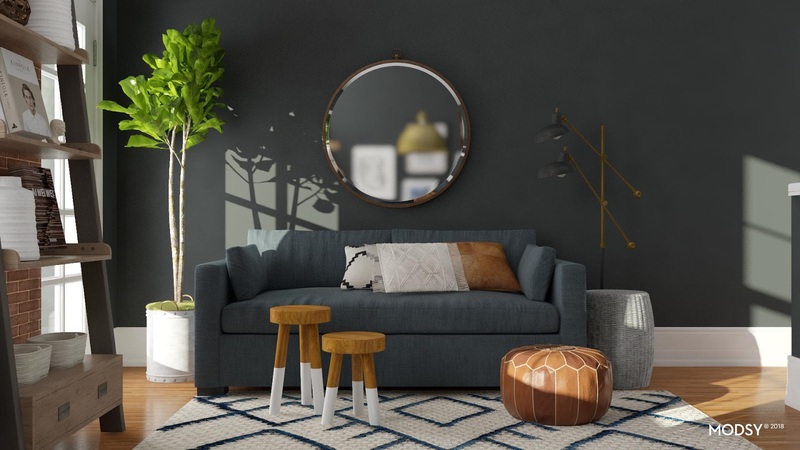 If you're struggling with a challenging space, want to visualize furniture you're considering in your exact room or just want to understand your home style better, Modsy is offering 20% off any regular design package exclusively to our readers with the code 17APART20! All three are stunning - the lights in 2. clinch it for me - especially next to that gallery wall! What about your radiator/heater by the door in your pics? Is that a permanent fixture?